Need help with your collection? Making a good collection can be an investment in time and effort. But it will be of huge benefit over time in reduced designing effort, better understanding of project costs, project manufacturing and client presentations. 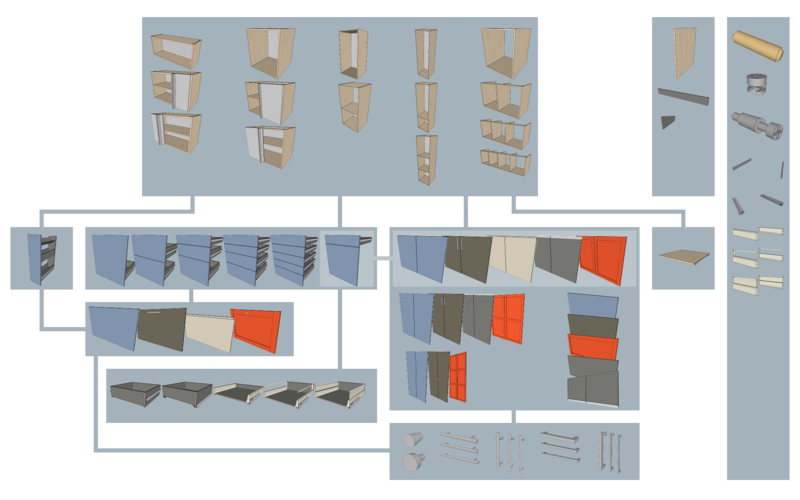 Getting the structure right, the learning curve of Sketchup’s Dynamic Components, and identifying important features to build into your components, can a bit of a challenge. But fear not, help is here. If you looking for assistance to make you own collection from scratch or maybe converting a collection you already have, let me hear from you. Send me an email to boxup@mogensen.co with a small description and maybe attach documents or images that describe the collection you want to build. I will be happy make a quotation for you. If you looking to make collections for clients, I would also like to hear from you. Scandinavian style kitchen modules based on sheet materials. The box|KITCHEN collection is included in the plugin, for reference, as bases for your own collection, or use as is. Diagram shows an overview of components in the collection, and how they are inter-changeable.